Shoes Or No Shoes, Is That Really The Question? | Run S.M.A.R.T. Shoes Or No Shoes, Is That Really The Question? I’m often encountered with the question of whether it is it better to run barefoot than in shoes. The ‘barefoot movement’ has made a real impact on modern running, flaunting the technical benefits of running in the most ‘natural’ way for our bodies to minimize injury and maximize our performance. Through both its merits in improving running technique and for its trendiness, barefoot running seems to have made a lasting impression. Running shoe companies have jumped on the bandwagon, manufacturing ‘barefoot shoes’ (could there be a greater oxymoron?) and nearly every running shoe brand has its version of a barefoot or minimalist shoe. Both types of shoes claim to allow you to run more naturally and use less energy because you don’t have to lift the mass of the shoe with every stride. Although traditional running shoes offer a lot of protection to the foot through their thick soles, they also encourage heel striking, which supports the statistics that nearly 75% of runners are heel strikers (Hasegawa et al., 2007) because most runners wear traditional running shoes. If you’ve ever tried barefoot running as a heel striker, you’ll attest that hitting the ground heel first is painful, and you probably quickly found yourself striking mid-foot. This is the ‘natural’ way to run, one that you’ll quickly find by removing your shoes. Hitting the ground mid-foot has been shown to reduce the loading rate of the impact shock that travels up your leg with the impact that is experienced during heel striking. 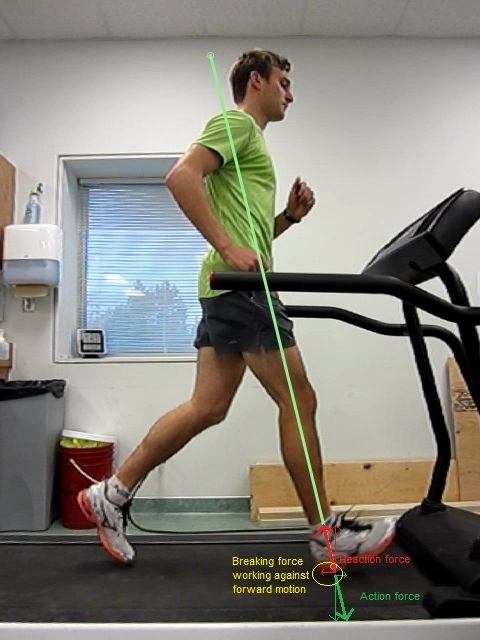 An increased loading rate (how fast the shock travels) has been shown to be associated with running injuries (Milner et al., 2006). 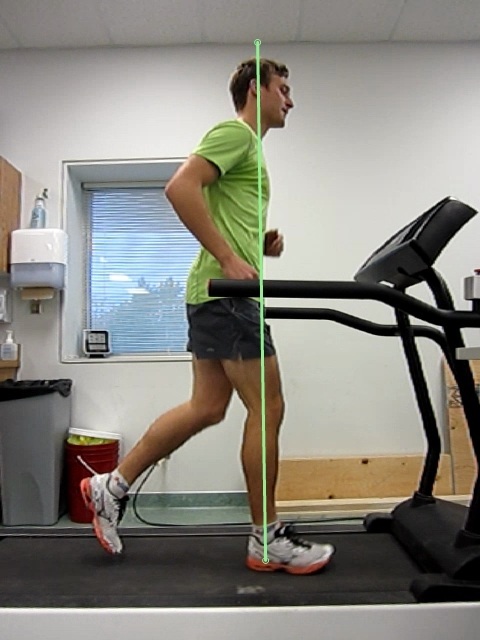 Furthermore, heel striking with your foot out in front of your body (Figure 1) when running is pretty much like throwing on the brakes with every step. Your body must overcome the braking force in order to move forward, costing energy and potentially causing harm. The danger with going barefoot? Well, aside from the immediate concerns of cuts and bruises, after running for a lifetime with shoes it’s going to take a long time to acquire this new skill and allow your body to adapt to the stresses imposed on it. Try telling a 50-mile-a-week runner that they can now only run a few minutes each day. Transitions to barefoot running take time and patience, but that’s another topic for another day. So if more focus on actual running technique is more important than what you wear on your feet, more time should be spent on running technique improvement rather than the ‘quick fix’ of wearing a different pair of shoes. Running is a skill, and changing the equipment requires time to adapt for a new technique. Nikki Reiter is the official Biomechanist of The Run SMART Project. She has a Masters in Biomechanics and is a certified exercise physiologist. If you have questions regarding your running form/biomechanics or want to set up a gait analysis with Nikki, email [email protected].